Well done John – it’s only taken two years of campaigning. And longer than that since that junction was known to be lethal to pedestrians and cyclists (I was talking to my family and I was right – my sister did break her leg there when a car knocked her down, must be about 10-12 years ago). Sadly I have a feeling that if the Olympics weren’t happening just up the road, and if it hadn’t been somebody who was employed on the Olympics who was killed, Boris would not have cared less about the danger at that roundabout. (I could add something really callous about the chance of losing a few more Labour voters in a safe GLA seat…but that would be really evil and possibly too Machiavellian even for Boris). 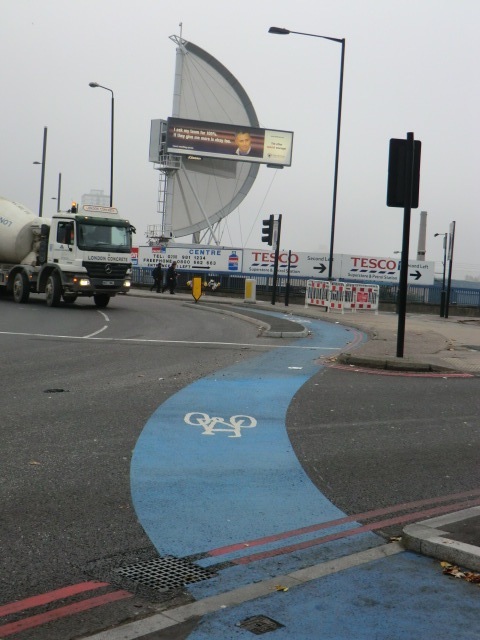 Not that Ken was much better – all that Boris did was stick a swathe of blue paint on the road to give the impression that cyclists had any right of access at all. The junction was dangerous on Ken’s watch and he did nothing about it either. Maybe our wonderful Mayor can use his alliance with Ken to get some changes made.